As these are very colourful fish and for maintaining the colour they will need a lot of vitamin, you will need to feed them the best quality flakes and granules with some vegetable matter. Bear in mind for the best results they will also require live or frozen food like bloodworms, artemia, fruit flies and so on, on a regular basis. They are not picky, on the contrary, if you overfeed them regularly, they will get fat. This betta is originally from central Thailand. But as its popularity grew as an ornamental aquarium fish and also for its aggression used in fighting matches, it spread to other east Asian countries as well. They can be mostly found in still waters like swamps, ponds, big ditches, streams and so on. These waters are mostly muddy with heavy growth of plants. The plants can either be the floating kind or the submerged ones, but either way they mostly do nothing for increasing the amount of oxygen in the water. That is why the fish developed the ability to breath both under and above the water. It is very easy to tell which one is a male and which is a female. Males are very colourful with longer fins, but thinner bodies. Females are bulkier with short fins and their color is dull. They breed using bubble-nests. The male will create small bubbles from his saliva and bubble by bubble he’ll build a nest. The best is to separate only one female and a male into the breeding tank with stable water parameters. In the breeding tank, in comparison to a usual tank, it is much more important to keep the water movement as slow as possible so the current will not destroy the nest. You can help it with some floating plants or by planting long plants in front of the filter. The tank should also have lots of hiding places for the female such as heavy growth of plants or some ornaments, so once the breeding is over, the male will have only minimum chance to see her. Also don’t forget that the water level should be lower than the edge of the tank, so the fry can breathe too. The act of breeding starts when the pair starts to circle and dance around each other. When they are ready, the male makes an U shape from his body around the female and squeezes the eggs out of the female. At the same time he releases milt and the eggs are fertilized. Then the male collects the eggs with his mouth and carefully places them into the nest. This might be repeated few times. When they’re done, the female will not take any part in raising the fry and she will be chased away from the nest. If there is enough space for the female to hide, you don’t have to separate her, but if the male will see her too often, he might kill her while protecting the nest. The eggs hatch after one or two days, but the fry stays in the nest for another about 4 days. The male will protect and care for the fry until it is big enough and it can swim freely. He will swim below the nest catching any fry that falls from it and returning it into safety. The fry can be fed by infusoria, but also by crushed granules. Even after the fry swims freely, the male will not try to eat them. Under right conditions, Betta will live for about 2 or 3 years. This means slightly acidic water, no stress from other tank mates or its own mate. And of course the fish has to come from a good breeder who avoids inbreeding which may be common with this popular fish. In spite of common custom, Siamese fighting fish likes heavily planted tanks and a lot of space. They are absolutely not suitable for fish bowls and miniature tanks they are often photographed in. It is a real shame that you can keep only one male per tank, but if you give him the right conditions, he will show his happiness by building a bubble nest even if he is not breeding. The tank should have dim lighting and the minimum size for one betta pair is about 60x30x30 cm. Also provide hiding places like caves for the female in case she will be harassed by the male too much. The water does not have to be the best quality, but it should be slightly acid, with slow current and the water level should never reach the top of the tank, since they breathe atmospheric oxygen too. Place a cover above the tank, since they may jump out. Especially the females. Betta splendens is very peaceful toward other fish. Despite of that, they will feel the best if you’ll keep only one male and one or more females in a tank with some peaceful bottom dwellers. Definitely avoid any, even slightly, aggressive fish, but also peaceful but fast moving fish like tetras. Their quick movement might stress bettas. And always have in mind, that they do best in a slightly acidic waters, so all the tank mates have to tolerate it too. The behavior toward its own species is more complicated. If you put two males into one tank, the stronger will kill the other one. If the male doesn’t like the female, he will kill her and even if the male is too weak the female can kill the male too. That is why you should watch how the new bettas will tolerate each other the fist days after you place them into the tank. The only slightly possible way how to keep more male bettas in one tank is to keep a breeding pair and their children in a big aquarium. Then the breeding pair are dominant fish and the other ones should not feel such a strong need to kill each other. This fish was and still is used in fights, where two males are put into one tank and they fight to death while onlookers bet on the one or the other fish. This might be the reason why the fish from aquarium trade are more aggressive than the ones in the nature. The wild form in the aquarium trade is very rare. It is not as flamboyant as the commonly sold fish which you can find in many colours and fin shapes. The common colour variations are red, blue or the combination of those two colors, but you can find them in white or almost translucent, yellow, purple, green even almost black or multicoloured. The fins can also vary. 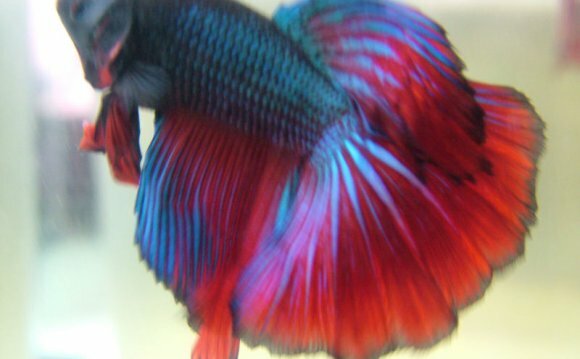 They can be long, short, super long, wavy, ruffled, spiky and the tail can be even double.All Betta’s keepers should also visit Nippyfish.Net - a site for the modern betta enthusiast!